Matt Vashlishan is a multi-woodwind instrumentalist from the Pocono Mountains of Pennsylvania. 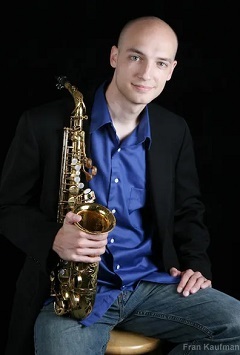 He holds a DMA in Saxophone Performance from the University of Miami, a MM in Saxophone Performance from William Paterson University, and a BM of Jazz and Contemporary Media from the Eastman School of Music. Matt is currently the Director of the University Jazz Ensemble at East Stroudsburg University, as well as the University’s Jazz Program Coordinator of the Al Cohn Memorial Jazz Collection and editor of The Note. Matt is an active sideman, most notably with David Liebman’s Expansions Quintet. He directs the Water Gap Jazz Orchestra (previously the Phil Woods COTA Festival Orchestra) in Delaware Water Gap, PA, which is a professional large jazz ensemble comprised of local and international professionals.